The theme for March 2015 Friends of the Planetarium weekend is Science Fiction! We’ll have a high-definition full-dome show, science fiction quizzes, a sci-fi talk, a panel discussion with sci-fi authors, a Mystery Science Theater feature movie and, as our Sunday show, Perfect Little Planets. Introducing the topic for the weekend, Kathi Overton will give a brief review of the history and development of the science fiction genre. A screening of a Mystery Science Theater 3000 film will immediately follow her presentation. This show explores a timeless question: Do other Earth-like planets exist in the universe? 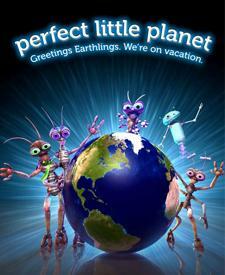 Travel to distant stars and explore an exquisite and diverse array of alien worlds orbiting other stars: exoplanets. As the number of exoplanets soars into the thousands, space-and ground-based telescopes, such as NASA's Kepler telescope, are revolutionizing our view of the universe, bringing humankind one step closer to finding habitable worlds orbiting other stars. Test your SciFi Knowledge with Trivia! Come meet quizmaster, Doktor Sinister, as he poses questions from the worlds of Science Fiction! Prizes will be awarded and costumes are welcomed!. Maybe wear your Dr. Who scarf and take a selfie with a Storm Trooper... In the Sci-Fi universe, there is no telling what could happen!! Join us Sunday afternoon for a panel discussion with four distinguished science fiction and fantasy writers as they talk about how they handle and include science into their works. Panelists include: Catherine Asaro (Saga of the Skolian Empire series), Tom Doyle (American Craftsman 2014), Ed Lerner (Energized 2012), Alan Smale (A Clash of Eagles, 2010). Moderated by Tom Schaad, host of Fast Forward: Contemporary Science Fiction. Fly over the surface of Pluto, dive down the ice cliffs of Miranda, sail through the rings of Saturn, feel the lightning storms at Jupiter and walk on the surface of Mars. Which destination would you choose? Learn about the solar system with this full-dome digital show. Admission for these shows is $3 for Children (up to age 12), $5 for Members and Seniors (60+), and $7 for teens and adults. Seats can be reserved on this website right now. Just click on the event you would like to attend in the table of shows at the top or bottom of this page and use our online form to buy tickets and reserve your spot. Some of the seating will be held for walk-in visitors. Unclaimed reserved seats will be released when the show begins. Tickets purchased in advance are refundable for any reason until the show for which they were purchased begins. Online ticketing will end 30 minutes prior to each show, and any unreserved seats will be made available on a first come, first served basis. To download a colorful 8x10 poster advertising this month's weekend, click here [949K PDF].